Charles This elegant, new go term is apparently required for discussion of current advanced opening theory. 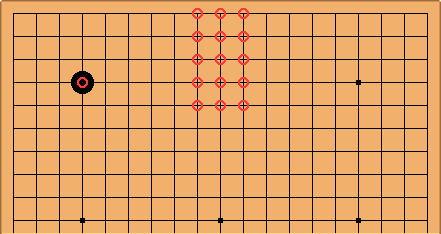 To be more specific, something like this is said: the particular areas marked here with squares, on the lines 6 to 8 out from the corner, have a special role in relation with 4-4 point openings. One can make preliminary sense of the left-hand 'armpit', in relation to the stone occupying the corner; and the 10-4 stone . Plays by White in this marked area do not 'touch' either stone. That means we are thinking of the corner area as bordered by these circle-marked stones. 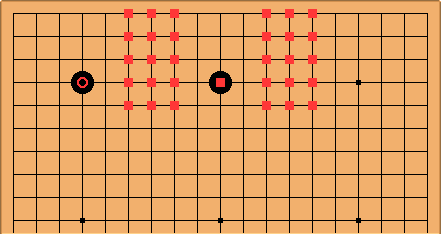 Looking at this area - outlier points - also clarifies the contemporary (post-Chinese opening) idea that it is valuable for Black to prevent White making a strong group here, in developing . 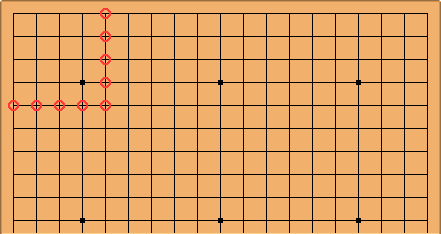 This all leads to the idea of looking at White's joseki options within the armpit. Here is perhaps better known, played at a. The play at emphasises making a base. Characteristic is therefore a base made as a short extension. This isn't very efficient. It may lead though to immediate life, which is of value according to Black's framework prospects on the left side. We can compare that with this . 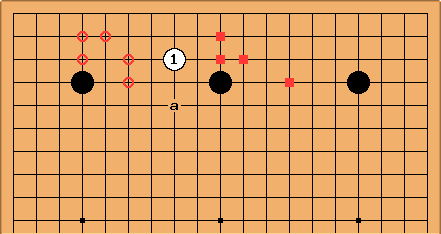 It creates a type of miai position (White expects next to have a choice of the circled points, or of the squared points.) White also may just jump out to a. This direct entry into sanrensei was played in the shinfuseki period, but not so much since. White in pro games may play , but in a context with some other stones played outside before that. It is in rather a different setting that this currently seems to matter for aspiring theoreticians. 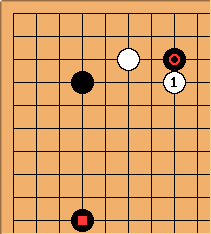 Here is a potentially difficult joseki play, in some variations, taking into account the stone. 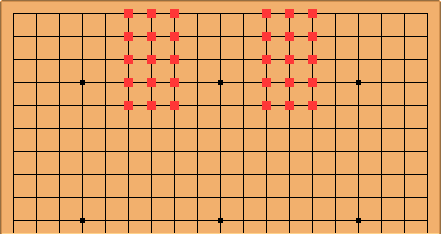 White may take a short base; or influence across the armpit, in both the tsukehiki and tsukenobi variations. 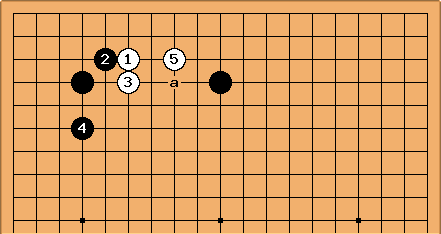 Gresil: For an interesting lead see GoGoD's New in Go #12, in which these regions are discussed in the context of Go Seigen's opening theory. John F. Charles was at the seminar referred to in the GoGoD reference above. I think he misunderstood a throwaway comment and intepreted armpit (Jap. waki) as an area of the board. In fact it refers to the points on the third line diagonally away from the centre star point (and more strictly is a person's side). There was no term proposed for that specific area, but I proposed that a safe group established in that area in the opening be called a Go Seigen group. I also introduced the term Chernobyl area in connection with it. For the Paul Ohmart usage mentioned, the Japanese is kado.